The information on this site was accurate when written, but things change and you should always check the General Competition Rules (GCR’s) in the latest version of the Manual of Motorcycle Sport (MoMS). If you are age 16 and over you can enter any meeting. Age 12-15 you can enter Junior races. At 15 you can enter Limited races on specified bikes. Yes, you need a competition licence issued by the sport’s controlling body. Go to Track Licences for more information. An accident can be your fault or someone else, the result is the same… you end up lying on the track next to your damaged bike. Flag Marshals will warn following riders to slow, minimizing the danger of a secondary incident. The track ambulance and pick up vehicles are standing by and can normally be with a fallen rider in under a minute. Riders are not liable for any damage or injury they may cause to others. You are all responsible for your own repairs/costs. If you are injured, the track ambulance will take you back to the first aid centre. If required, an ambulance will be called to take you to hospital AT YOUR EXPENSE. The minimum cost is $1000 so we recommend all riders have St John Ambulance insurance. If your bike cannot be ridden, it will be picked up and taken back to the pits at the end of your session. Your bike and equipment must be re-examined before it can go back on the track. The track closes at 5pm and it is up to you to remove all your belongings. If you don’t have a friend with you who can take your car/bike/equipment home, we will ring your emergency contact and advise them of your situation. Your MA Licence provides cover under Motorcycling Australia’s injury insurance policy but benefits are limited. We recommend all riders have Income Protection insurance. You will need to complete an entry form. These can be downloaded from the promoting club’s website and an online version should also be available. Ideally, submit the entry form two weeks before entries close as there may be limits on the number of riders in each race. At the track you will need to go through the sign in procedure. Riders who have not already been advised a racing numbers will be allocated one at this time, and numbers will be available for sale. You then have to get your bike and equipment scrutineered. This may take place in your pit garage or you may have to take everything to the scrutineering bay (you’ll find out on the day). A scrutineer will check your machine and equipment to make sure it complies with the rules. A sticker will be fixed to your helmet and machine to show that they have been checked and approved. After scrutineering there will be a compulsory riders briefing. Here the Clerk of Course will run through the basic rules and any special conditions which may apply to the days racing. You will then sign a form to say you have attended the briefing. Next there will be a practice session for you to begin learning the circuit. Practice is conducted in groups, so listen to the PA announcements in the pits for your session to be called up. You will go to the Pit Gate and wait to be let onto the track. After practice, qualifying sessions will be held to determine your grid position with the fastest riders being placed at the front. For Bracket Racing, this also determines which group you will be placed in. Grid positions will be posted in the scrutineering bay and you will be expected to know your spot when you arrive at the start line. Hint: put some masking tape on your tank and write your grid positions on it. Your races will be called up over the pit PA system, normally on the last lap of the previous race. This 3 minute warning gives time for riders to have a last minute check and get themselves to the Pit Gate in time for the start of their event. When released, proceed around to the start line and stop at your grid position, then watch the Assistant Starter holding a red flag. When the Starter thinks everyone is ready, they will point to the starting lights and leave the grid. When the red light goes out, you’re racing! But don’t be too eager, there are penalties for jumping the start. KEEP LISTENING to the pit PA system – if the program changes you might miss your race. If you are late for your race, you will be stopped at the Pit Gate and the Marshall will radio for approval to let you go. You may miss the first lap of the race and come last so you have to decide if its worth going out. The person in charge of the administrative aspects of a meeting. 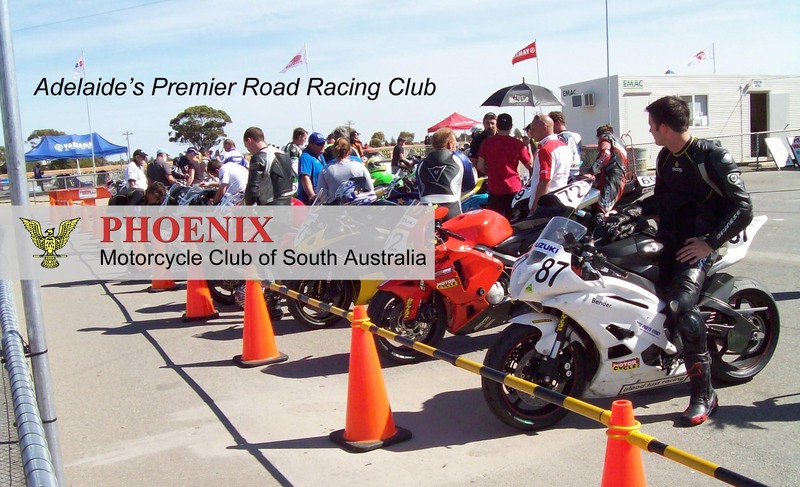 Matters concerning your entry, fees, grid positions and equipment should be directed here. If you have a problem with the way the meeting is being run, see the Clerk of Course. The Clerk of Course controls the meeting, see their assistant if you have a problem. They will ensure that the circuit is safe and the officials are at their posts. They will refer to the Steward any problems they can’t solve. The Steward is Motorcycling Australia’s representative and has the power to enforce penalties and adjudicate over the rules. Ensures that the correct riders are on their appropriate row at the due time. Controls access to the track. Don’t argue with them if you are late. They will radio Race Control for permission to let you out.